The actor Bando Tamasaburo (b. 1950) is in the role of Agemaki from the play Sukeroku (Sukeroku). Tamasaburo received the title of Living National Treasure from the Japanese government in 2012. This composition is one of the earlier kappazuri (stenciled) prints produced by Binnie, and the first featuring a kabuki subject. Unlike traditional woodblock prints, kappazuri prints are produced by laying stencils on the paper and applying ink through them. That is, the compositions have a concern for surfaces, not lines, and come together through the collocation of different spaces of color. 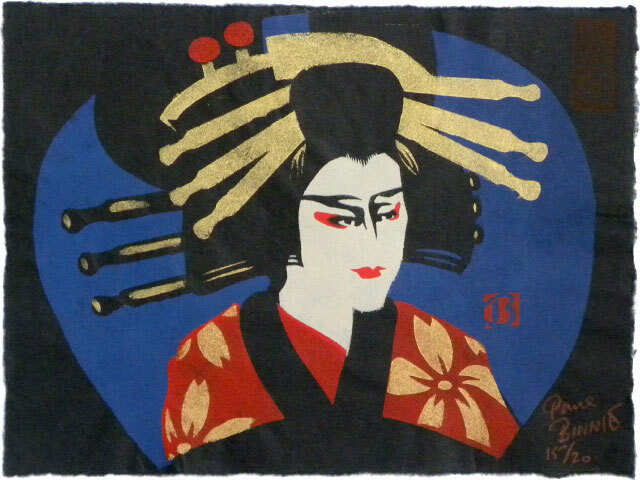 The role of Agemaki is that of a beautiful Yoshiwara courtesan. She and the young and combative Sukeroku are in love, much to the consternation of one of her patrons, Ikyu, a wealthy but older samurai who secretly also happens to be the man who murdered Sukeroku's father and stole the family's ancestral sword. Working together, the lovers prove Ikyu's guilt, and Agemaki encourages Sukeroku to confront the samurai and avenge his family's honor. After Ikyu is finally killed in a climactic public duel, Agemaki helps Sukeroku escape as a gathering crowd tries to catch him by hiding him beneath her kimono and leading him safely out of the pleasure house.